The power and intent of connectivity to deliver the best end-to-end IoT solutions have propelled us to work upon customized IoT solutions. Senrysa Technologies leads as one of the renowned IoT solution providers in India that focuses on interoperability alongside effective security of the data transferred through the custom-built connected IoT devices. The IoT solutions provide integration of business logic and strategies to the connected devices and cloud systems. Smarter the devices, smarter will be the scalability and flexibility of business decisions. IoT based solutions are implemented in manifold work sectors for boosting the business’s productivity; helping the devices to be in check, serving accurate purposes. Ensuring the security of the data, we provide customized IoT framework for the clients to use it with full security. Effective IoT solutions and services are modelled for a functional output from the integrated IoT systems. Architectural framing of the IoT designing are forged in accordance to the functionalities and operational requirements. IoT systems deal with IoT analysis and real-time data insights that help to calculate, predict and enhance decision-making abilities. Maintenance of technological system is significant for any IoT based product. IoT operational functionalities are ensured with maximal cognizance. The implementation of the IoT system is ensured to run smooth and adequate as per the need. Access to front-end operations, studying data insights and other functionalities can be easily operated. The sensor and internet-enabled IoT devices help access and monitor real-time analytics aiding the clients to understand the business statistics with a justified business making decision capability. Senrysa Technologies pioneers among the IoT solution providers in India by transforming various core industries and service sectors into smart working zones. Banking industries are transforming their operations into more advanced and technology-oriented platforms. Operational and remote access technologies for serving IoT based banking solutions are what Senrysa is in into. Financial Sectors has adopted the latest technologies for better operation and management. 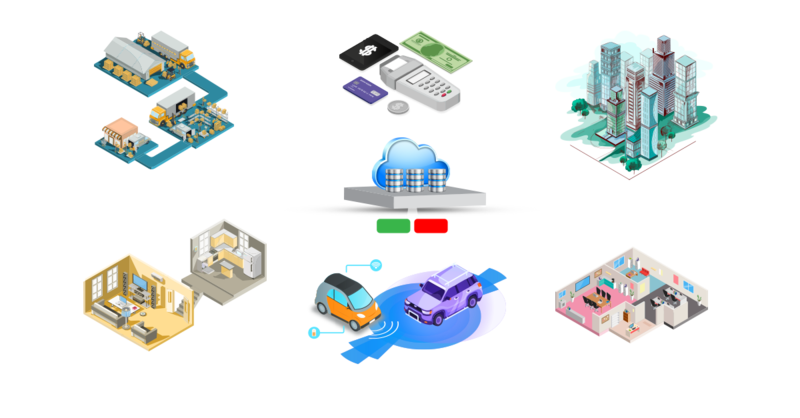 We focalize on the implementation of IoT solutions for improving Payment and transaction security, Real-time data analysis, advanced customer service etc. IoT solutions in healthcare sectors come in wearable form, the data of which can be tracked and monitored in real-time; such as surveying, detecting, and monitoring different health issues, health patterns and much more. Agriculture is a predominant economic backbone of this nation. IoT based smart agricultural and farming practices are where technology has reached to its epitome.